Levi Dean, born in Virginia, late of the Rocky Mountains, late of Nashville, lately seen around University Heights, Normal Heights, and North Park, has had good and bad shows all over the country. 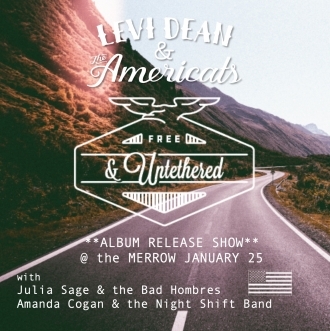 San Diego, CA – Levi Dean and the Americats are thrilled to announce the release of their debut album, free and untethered, on January 25, 2019 and will be available at online platforms such as iTunes, Spotify and CD Baby. Anyone who is a fan of the local acoustic music scene has likely taken notice of Levi Dean. Either solo or with his band The Americats, Dean’s blend of blues, folk, rock and country has steadily won over audiences throughout the area, mixing traditional sounds with the contemporary; at times his songs are reminiscent of Dylan circa 1968, at other times they come across as radio friendly modern country. On Feb. 18, Dean will perform solo as part of the monthly Songwriters Acoustic Nights series, held at Holy Trinity Anglican Church. The night will also include Fast Heart Mart, Chad Taggart and Grayson Scheiner, trading songs and stories in the round. In concert, Dean focuses on his own music. “Specifically, I write songs about paradox: the cycles of love, heartbreak and the spiritual hero’s journey we all go through over and over again. I play 95 percent original music, but will throw in a few covers. For example, the crowds enjoy ‘Hot Tamales’ by Robert Johnson and ‘Hey Good Lookin’ by Hank Williams Sr.,” he remarked. Dean and the Americats are currently recording, working on their second album with producer Andrew Nast of Audio Design Studios. Plans are for a late spring release. Dean equally enjoys live performance and studio work, his favorite part of playing music is in the interaction with other people. “I am passionate about collaborating and pouring different influences into the pot to see what comes of it,” he said. “Birthing a new song is the greatest feeling in the world and to witness that song have a positive impact on someone is pretty cool too,” Dean remarked. We are proud to officially announce the upcoming release of our new Album “Pushing On.” The official release date is 7/8/2016, but will be available online as early as 6/15. We would also like to invite you to our album release show that will be held at the Black Cat in San Diego the evening of 7/8. We hope to see you there.